TECHRIGHTS is gratified to see that shortly after writing 3 articles about Microsoft’s latest anti-Linux patent deals [1, 2, 3] there is a Web-wide debate about it, and it extended far beyond the GNU/Linux world. 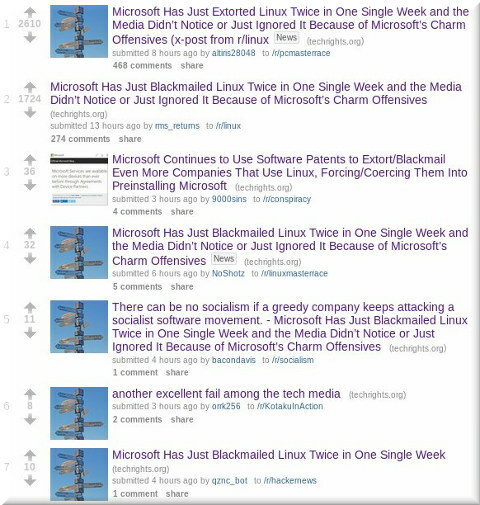 The various threads about it are approaching 1,000 comments in all sorts of sites (hard to keep up with it all) and people express their justified anger at Microsoft. An English-speaking news site wrote yesterday that “not all strands of the open source community are welcoming the open source-Microsoft rapprochement. Christine Hall at FOSS Force filed an analysis this week in which she wrote that Microsoft’s moves “are based solely on greed” and represent a “one-way street” to drive more business for Microsoft. “It’s a scorpion or a snake in the parable sense.”Yesterday we mentioned Simon Phipps’ IDG article about this. Shortly afterwards, accompanying his IDG article (maybe stating what’s not suitable for publication there) Phipps released this piece in his personal blog and said: “I went to the Microsoft press release page looking for the news about Linux support for SQL Server and joining Eclipse. Much to my surprise, there was nothing there. But there was something else; a press release celebrating the signing of another Linux user into Microsoft’s patent licensing regime and another celebrating an Android patent win. Nothing about SQL Server, Eclipse or any other positive open source engagement. They probably never will. It’s not in their nature. It’s a scorpion or a snake in the parable sense. Simon Phipps comments on Microsoft’s latest antics in regards to open source. Specifically, while the public is distracted by show, Microsoft is shaking down the Android/Linux and GNU/Linux communities for patent licenses. Phipps asserts that it’s time for them to put up or shut up by either joining the OIN or admitting that they can’t be trusted in the open source community they now claim to love. Roy Schestowitz has some harsher words on the same topic, noting that the media is ignoring malicious actions in favor of paying attention to the public relations campaign. While the OIN cannot protect against NPE’s aka patent trolls, it is created for just this kind of situation and choosing to join — or not — sends a very clear message about their intentions towards the community. “We hope that our few articles on the topic of Microsoft and GNU/Linux will be enough to leave a lot of people with sobering balance and a broader perspective on things.”There are many comments in there, including: “Simon has written more over at his personal blog. He asks people to join him in answering every M$ announcement related to open source with “But have they joined OIN yet? [webmink.com]” until they actually do. M$ can’t expect to carry on patent shakedowns and also be respected as an open source peer.